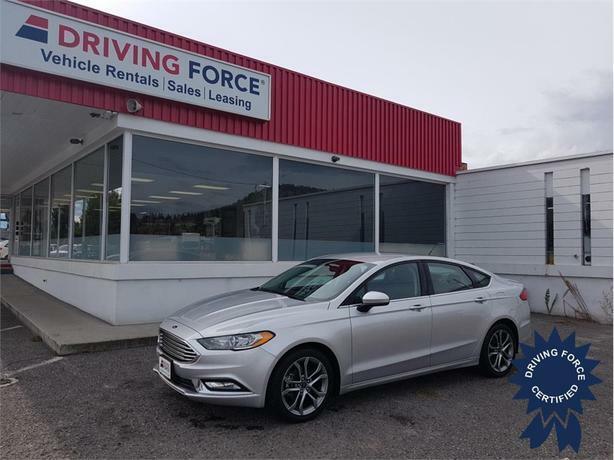 This 2017 Ford Fusion SE 5 Passenger Front Wheel Drive Sedan comes with a 6-speed automatic transmission with SelectShift, 3.07 axle ratio, 18-inch premium painted dark stainless wheels, ingot silver metallic exterior color, cloth/vinyl front bucket seats, Fusion SE Technology Package, Automatic Stop Start, engine block heater, reverse sensing system, voice-activated navigation system, 62.5-litre fuel tank, brake actuated limited slip differential, chrome grille, LED brakelights, SYNC including 4.2-inch LCD screen, smart-charging USB port, enhanced voice recognition communication and entertainment system and 911 Assist, Bluetooth wireless phone connectivity, three 12V DC power outlets, tire specific low tire pressure warning system and backup camera. The 1.5-litre Ecoboost gas engine provides 181 horsepower at 6,000 RPM and 185 lb-ft of torque at 4,320 RPM. Touch base with us to discuss purchasing or financing options that are right for you and experience the difference you will only find at DRIVING FORCE Vehicle Rentals, Sales and Leasing.